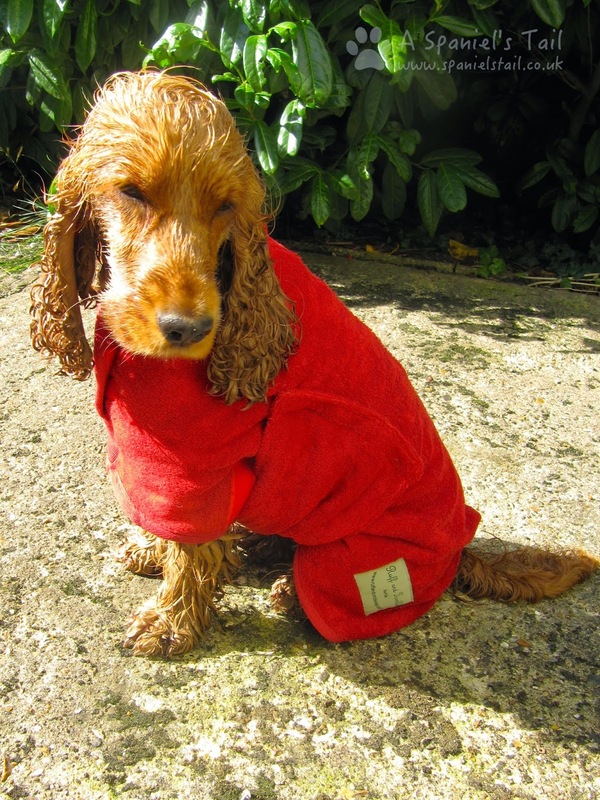 We received this drying coat to review from Ruff & Tumble a couple of weeks ago, and after having to have a bath to remove stinky pond smell (I don't know what Hoomans problem is with that), we recently had a chance to try it out properly. We were asked lots of questions about it too when Hooman posted a pic of me wearing it on our Facebook page and a Black & White Sunday post, so hopefully this will answer them all! 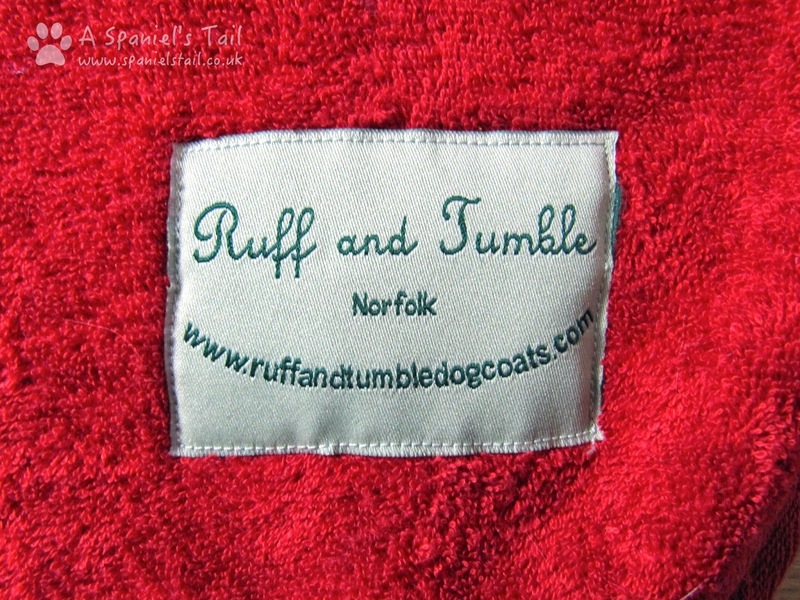 Ruff & Tumble was set up by a lady called Alison, a qualified dog groomer. Having four dogs who love their walks in all weather, come rain or shine, she was finding it difficult to find something on the market that would dry her dogs off, all seemingly made of man-made fabrics, difficult to get on and off, and not really liked by her dogs. So she went away, and designed her own drying coat for dogs. After developing and refining her design, the demand from her family and friends was so great that Ruff & Tumble was born! The Ruff & Tumble drying coat is modelled on horse blankets, designed to be easy to take on and off (and speaking as a very amateur horsewoman, Hooman can verify that horse blankets NEED to be easy to take on and off!). 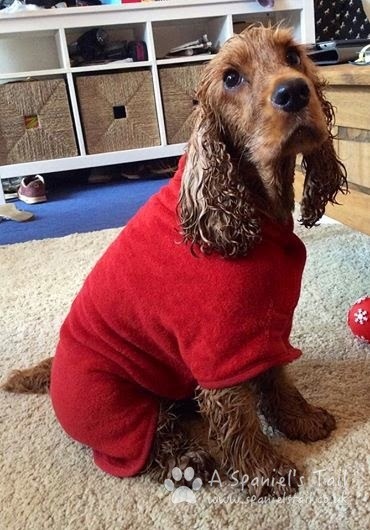 They are made from top quality double thickness cotton towelling, which makes the coats soft, highly absorbent and comfy cosy for the dog to wear. No complicated fastenings to deal with, just strips of velcro, so you can adjust the coat to be the perfect fit for your dog. 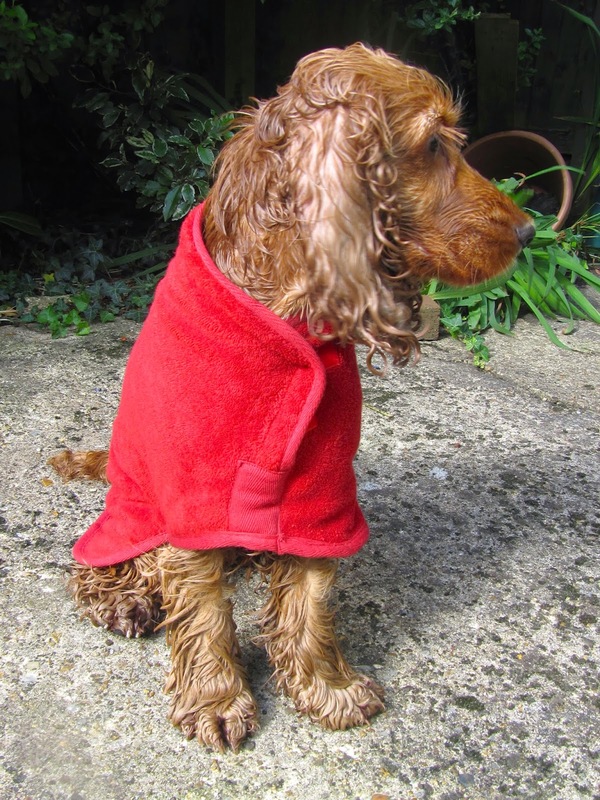 The coats also have a duel purpose - you can soak them in cold water in the summer, and they make excellent cooling coats for your doglets when the weather gets too hot for them! In a word? Loved it! (okay, two words). 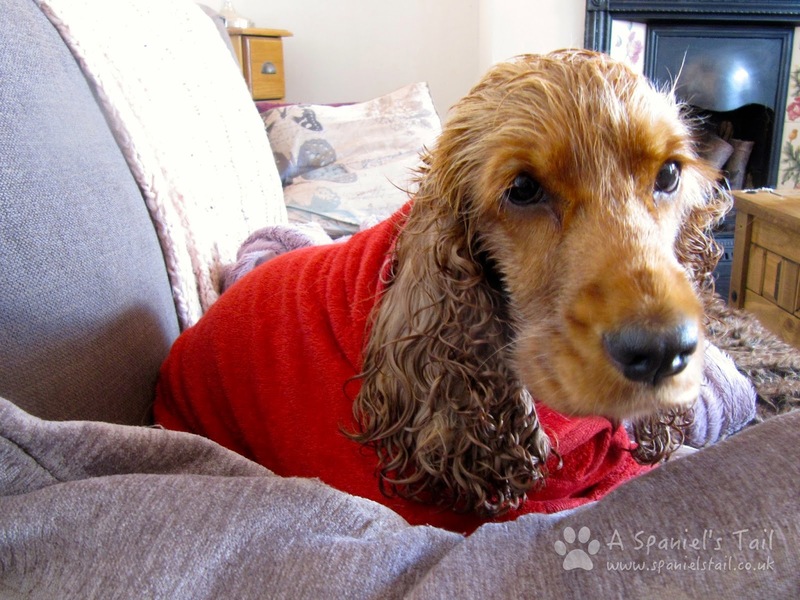 After throwing myself into a lake on Sunday and dousing myself with eau de stinky pond, Hooman had to give me a bath. Now, I have a tendency, even in the hottest weather, to turn into a tiny trembling ball when I've got that wet. So Hooman put this coat on me to see how it fared. First of all, it goes on very easily - simply slip over the dogs head and then wrap the strap around the dogs belly and velcro at the side. There is also a velcro fastening at the front of the neck, so you can get it nice and snuggly. 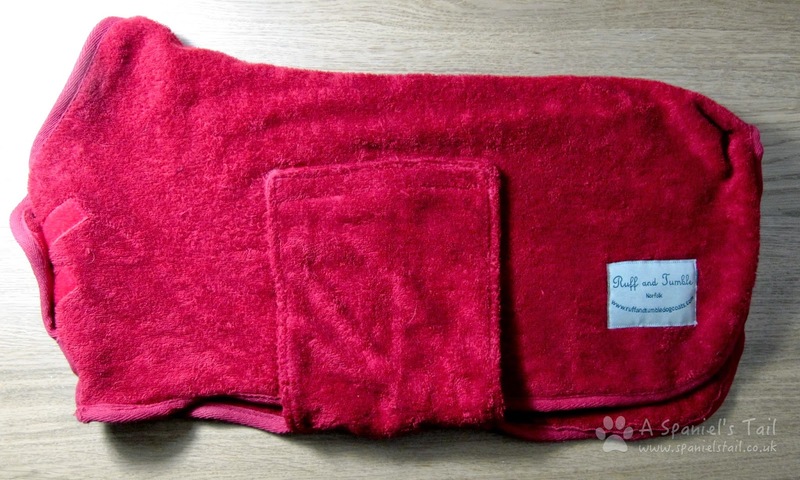 The towelling is very thick and absorbent, as well as being super soft. Additionally, Alison sent us the Brick Red model, which I thought looked very fetching with my colouring! It didn't completely get rid of the shivering - I am a delicate little flower after all - but what Hooman did notice was that where my legs were uncovered and still wet after some time, the areas covered by the drying coat (back, chest, bum, tum) were all dry as a bone very quickly! 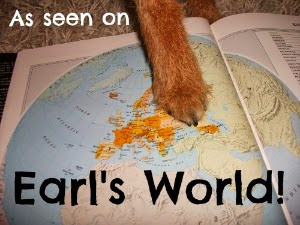 It certainly reduced my trembly time (and thus the time I can make Hooman feel guilty - is that a good thing?). I was quite happy curled up on the sofa having a snooze in it. We will certainly be putting this coat to good use - as it starts getting colder, but I show no signs of restraining from getting absolutely sodden at every opportunity, it will become hugely useful for getting me drier and particularly if we are out and about. 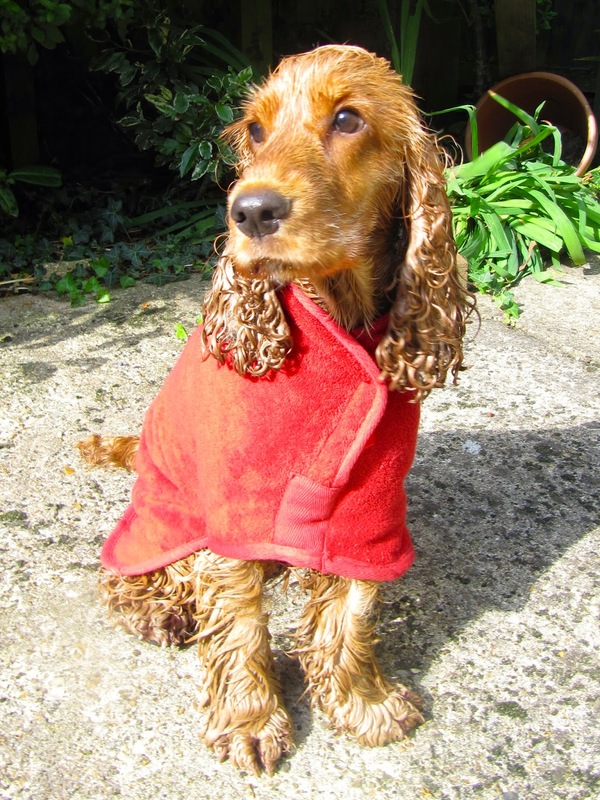 Top barks Alison, we love this coat! The coat I am modelling is in the Small size, and in the Brick Red colour. There are a variety of sizes available and four different colours. Coats start at £30 - click here to see and order from the full range. You can even have your coat personalised for an extra charge! I love the name of the coat and that is it my favorite color red! You are like me, though, with those long floppy ears. I need something to dry up my ears! That's not a bad idea, I hadn't heard of a drying coat. It really can get quite cold after a swim or bath. Looks really nice in the red color, too. That's a great idea, we have never heard of this coat! Great review, thanks for sharing! You're a perfect model!! 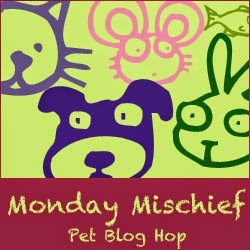 Great idea and the colour is so you Lottie. Have a marvellous Monday. What a great idea! Jeffie would love this. Great review! Question of the Month: It had to be you!